"The cold wax medium allows me to enter into relationship with the environment," says Cindy Walton. "The way a painting defines inner and outer landscapes, involves multi-dimensional levels and rich, intricate layers naturally suited to interpretation." GREENSBORO, N.C., May 13, 2014 (SEND2PRESS NEWSWIRE) — Noted abstraction fine artist Cindy Walton, of Asheville, N.C., shows selected works in “Beneath the Surface,” her series at the Tyler White Gallery, 307 State Street, May 16-June 30, highlighted by a Lunch and Learn demonstration Friday, May 16, from 11:30 a.m.-1 p.m., and attendance at the Artists’ Reception from 5-8 p.m. The painting, “Slice of Color” (2014, cold wax on panel) a centerpiece of the exhibit, is a deftly layered, color-driven work of emotion and light. Cold wax consists of a beeswax paste mixed with oil paints for a matte, layered texture. Walton’s mastery of the technique yields to her distinctive voice as an artist. The new works exhibited at the gallery are rendered in Walton’s signature style in the cold wax medium on panel. The collection was inspired by and the mountains of western North Carolina, where Walton lives and works today, as well as the Florida coastline of her youth. Curt Butler, the co-featured abstractionist in the exhibit, is a resident of Gastonia, N.C. Respected for his experimental approach to the realm of mixed media and multi-layered color combinations, his work may be viewed in distinctive galleries throughout the southeast. His work is characterized by a distinctive use of oil paints with encaustic hot wax techniques. The resulting in canvases meld conceptions of two- and three-dimensional space with imagery-rich, non-literal landscapes. Currently, Walton enjoys emerging prestige as an artist with increase significance in the national and international arenas. Demand for her work continues to increase steadily among discerning collectors regionally, nationally and abroad. Most recently, in April 2014, she received garnered international recognitions, including fifth place in the painting category and eighth place overall, from the annual “All Women Art Competition,” by the Light Space and Time, an online art gallery. Walton’ color-driven approach to her deeply emotive works led to her comparison to renowned colorist Hans Hoffman in a 2011 Asheville Museum of Art exhibit. Accepted to the juried National Association of Women Artists in 2011, she remains a fellow in the Virginia Center for the Creative Arts, with support from the Karen Shea Silverman Foundation Endowment, at the Creative Retreat, Mount San Angelo, Amherst, Va., since 2006. “Beneath the Surface,” a showing of the works of Cindy Walton and co-featured artist Curt Butler, runs May 16-June 30, at the Tyler White Gallery, 307 State Street, May 16-June 30. The event is highlighted by Walton’s Lunch and Learn demonstration Friday, May 16, from 11:30 a.m.-1 p.m., $20, and an Artists’ Reception from 5-8 p.m. which is free and open to the public. Walton will attend the opening. 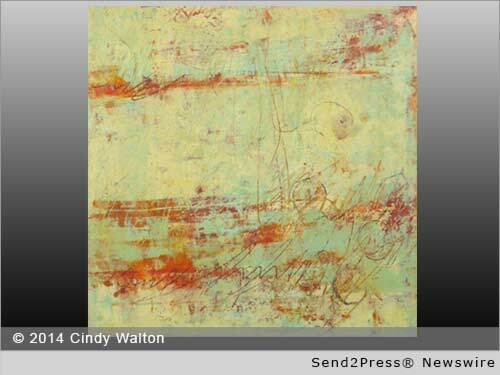 For more information on Cindy Walton, visit http://www.cindywalton.com/ and learn more about the Tyler White Gallery at http://www.tylerwhitegallery.com/ or call (336) 279-1124. * IMAGE CAPTION: The painting, “Slice of Color” (2014, cold wax on panel) a centerpiece of the exhibit, is a deftly layered, color-driven work of emotion and light. Original Keywords: Cindy Walton, Slice of Color, Tyler White Gallery Cindy Walton Greensboro North Carolina GREENSBORO, N.C.
REFERENCES: Entertainment News, Cindy Walton, Slice of Color, Tyler White Gallery Cindy Walton Greensboro North Carolina GREENSBORO, N.C.